Having the transverter for 47GHz band may be fun if you have the near corespondent on the other side to make some test and the QSOs on that band. 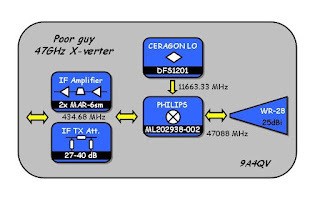 If you have nobody close in the area armed with the 47Ghz radio then you need to make two transverters which may be a bit expensive. I decide to make the second transverter from the surplus available parts and using simple approach. This is why the Poor guy 47Ghz transverter was designed, just to make the first 9A-9A 47GHz QSO. The transverter was built around the Philips ML202938-002 upconverter band 2/4 mixer unit. I get one thanks to Goran AD6IW who also measured the performance on 47Ghz using a bit odd approach regarding the original operation and function. Not so many information available for the Philips mixer and the most of the information are collected by reverse engineering, opening and inspecting the unit. The unit was a part of the commercial 38 GHz equipment. As this is the upconverter, probably there should be the downconverter too (with the different code-part number). Luckily enough they are designed in manner that both can be used as the up/down converter at the same time. The RF input/output use the standard WR-28 flange allowing the operation on 47GHz. Local oscillator and the IF port are using the standard female SMA connectors. 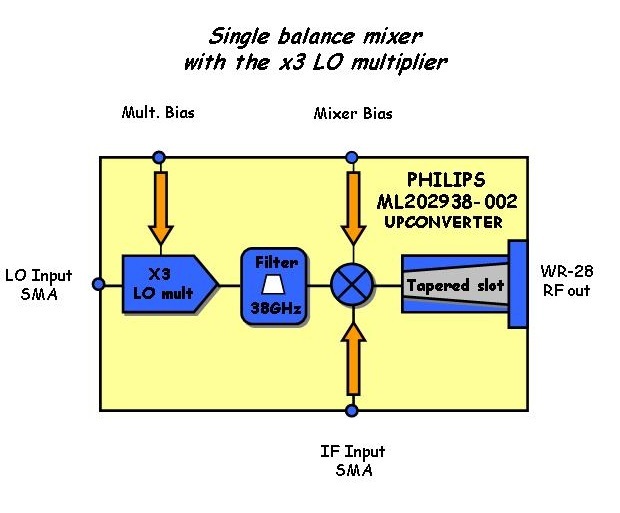 The unit operate as the single balanced mixer on the 38GHz. 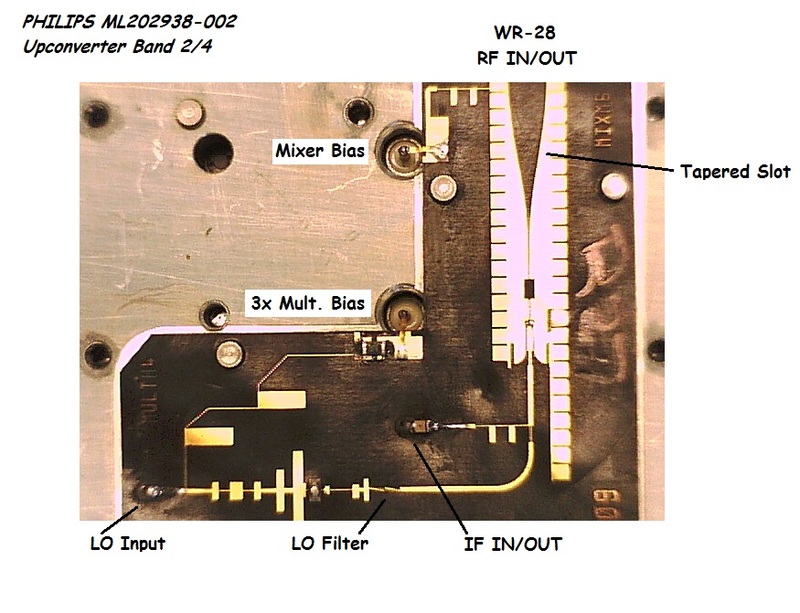 The unit has the internal tripler on the LO port where 1/3 LO frequency should be applied. The mixer diode is biased with the positive DC voltage for the best operation. We found that the +1.9V DC gave us the best results on 47GHz using the 1/4 LO frequency. And yes, I am not using the diode to multiply the LO 3 times but 4 times instead. This way I can use the widely available DFS-1201 Synthesizer. DFS-1201 can deliver the signal in range of 11.2 - 12.0 GHz reaching the output level of +15dBm. We are limited with the step of 3.333 MHz but the FT-817d used for the IF radio can handle out of the band operation on 70cm if required. Using the 11663.33 MHz for the 1/4 LO input the resulting IF is 434.68 MHz, well within the 70cm IF radio range. There is also the second possibility: using the 11880 MHz for the 1/4 LO input will result the high side mixing hence the IF of -432.00 MHz and using the LSB for the standard USB operation. The reverse tuning may be odd at the beginning but the advantage is that this way the right uW band operation is sure rather then making the qso on the IF frequency if they are the same for the both transverters. The same IF port is used for the RX and TX side. Some kind of switching is required to switch the IF radio. In the RX chain I use also the IF amplifier where the 70cm IF is further amplified and on the TX side I am using the attenuator to bring the IF signal down to 0 dBm required for the TX mixing. To have the possibility to play with the setup all this units are made separate in the shielded boxes connected with the SMA/SMA jumper cables. The RX IF amplifier is made of two MAR-6sm mmic devices with the 1 Ghz low pass filter in between. Two mmic devices deliver around 41 db of the gain on the 432 Mhz, more than required. To reduce the excess gain and bring the S-meter down to zero extra 16 dB attenuator is added at the output reducing the IF gain to 25 dB. This clearly indicate that only one MAR-6sm is enough for the IF RX amplifier. The same attenuator at the same time protect the RX IF mmic chain against the IF TX radio power that may damage the mixer if not properly switched through the IF switch. On the TX side I am using the standard Pi attenuator rated to meet the IF radio output power. All this boxes are switched using two small RF Omron relays G5Y type placed on the small dedicated PCB with the female SMA connectors. This allow quick change of the setup if required and simple 76 Ghz future transverter implementation. The 47 GHz RF output is not measured but not exceeding 10uW for sure. A short peace of the WR-28 waveguide was used to connect the homebrew 25dBi pyramidal horn antenna. And that's it, the Poor man 47 GHz transverter is ready for the operation and the first QSO. Does it work? Yes it does. I manage to make an easy qso reaching the 8 km distance without big problems even in the bad conditions, with the high humidity and temperature what can be seen in the following video. The frequency stability was not perfect but better then expected for the non shielded transverter. The other party 8 km away used the simple DB6NT 47GHz transverter running the 200 uW and the 32cm dish antenna and the IF on 144 MHz. There is plenty room for the improvements where at the end you can get the descent 47 GHz transverter. 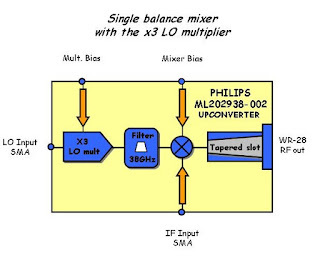 Fist of all, using the designed mixer topology and 1/3 of the LO frequency will result the higher LO level inside the mixer unit on the 38 GHz as there is the small filter reducing all the signals out of the 38 GHz band after the multiplier diode in the Philips mixer. To take the advantage of that the external LO should run on 12.240 Mhz. Using that approach, the IF radio should run on 10.368 MHz to reach the 47.088 MHz at the end. This should not be a big problem if we have the 3cm transverter already. The WR-28 waveguide output is matched for the 38 Ghz operation where 47 Ghz is on the edge. To match the port on the 47 GHz and to reduce the losses due to the mismatch the matching using the small screws on the WR-28 peace of waveguide can be used. At the end we produce the DSB signals, wasting the half of the energy and transmitting also the LO frequency. Adding the proper bandpass filter for the 47 GHz we will also reduce the NF for 3dB on the RX side. This will still result on a high overall NF of the receiver. This can be further improved by using the LNA. The same LNA can be used on the RX but also to boost the signal on the TX side. To save the costs, the same LNA should be switched using the waveguide transfer switch. The last advice, and maybe the simple one is to use the antenna with the higher gain. Small horn I made deliver only 25 dBi of the gain. This is handy for the quick portable operation and easy pointing and finding the right direction. The big boost will be using the dish antenna. Let say the standard 1 foot antenna which will result much stronger signal both on RX and TX side, hence much narrow angle and pointing problems. Smart idea how one can develop a simple transverter to chk out his master 47GHz eqmnt and also the IF cross-talk is eliminated..as you may just use for a short distance.Congratulation...!!! I found your weblog the usage of msn. That is an extremely well written article.I'll make sure to bookmark it and return to learn more of your helpful information. Your content is really helpful! Thank-you for sharing this great piece of Information. Best microwave oven. Thanks for reading this blog I hope you found it support & helpfully information. I have read your blog very good information on this blog. It was good knowledge from this blog. Your blog is a good inspiration for this blog. Best of luck your future articles.